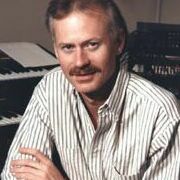 Scott A. Wyatt, composer and Professor Emeritus of Composition, actively served as a faculty member of the University of Illinois School of Music teaching music composition, music theory, and electroacoustic music, as well as serving as director of the University of Illinois Experimental Music Studios for 40 years. Among other honors that he has received, he was one of the winners of the International Society for Contemporary Music National Composers Competition of 1978, the National Flute Association's 1979 Composition Competition, the 1979 Concorso Internazionale Luigi Russolo Composition Competition in Italy, the 1984 International Confederation of Electro-Acoustic Music GRAND PRIZE at the 12th annual International Electro-Acoustic Music competition in Bourges, France and a finalist in the 1989 International Electro-Acoustic Music Competition in Bourges, France. He was the 1990 recipient of an Arnold Beckman Research Award for the development of digital timescaling applications, and among others, several 1996-2000 grants for the development and application of three-dimensional audio imaging for multi-channel audio presentations. He continues his research on positional three-dimensional audio for multi-channel audio today. He served as president of the Society for Electro-Acoustic Music in the United States (SEAMUS) from 1989 until 1996, and he remained on its Board of Directors until 2016. SEAMUS presented Scott Wyatt with its 2018 SEAMUS Award (a lifetime achievement award recognizing his important contributions made to the field of electroacoustic music). His compositions are recorded on 24 commercial recordings appearing on CENTAUR, GMEB Cultures Electroniques Series, Library of Congress, MARK, OFFICE, SEAMUS, UBRES and VERIATZA recordings.